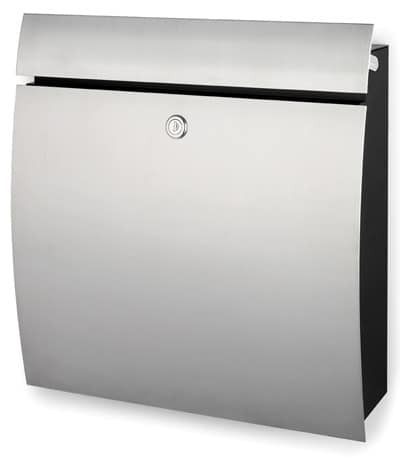 When looking for Wall Mounted Mailboxes, try adding a touch of modern contemporary style to your home or office with the Ecco E10 mailbox that features a locking mail slot. Similar to the sleek design of the Fluoriserie Ecco E9 Mailbox, the Ecco 10 mailbox features a larger mail slot (3 inches wider) and bigger letter box compartment that can accommodate larger envelopes. Perfectly sized to collect and protect all types of mail, the five small peak holes allow you to quickly see if mail has arrived. 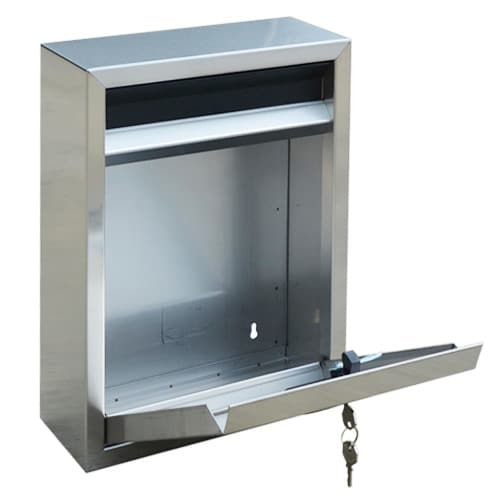 With hinges on the bottom, the wide locking front door conveniently opens down, allowing easy access to all delivered mail; the door stops opening just short of 90 degrees to prevent mail from dropping out. 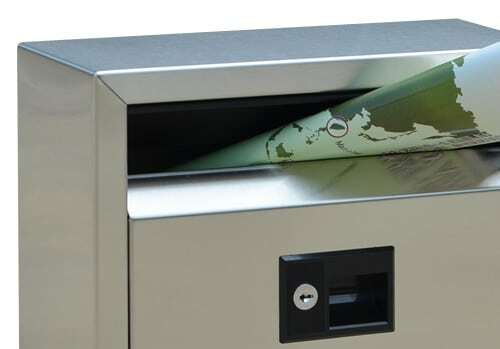 The specially designed pull finger on this Ecco mailbox helps to minimize fingerprints when retrieving mail. 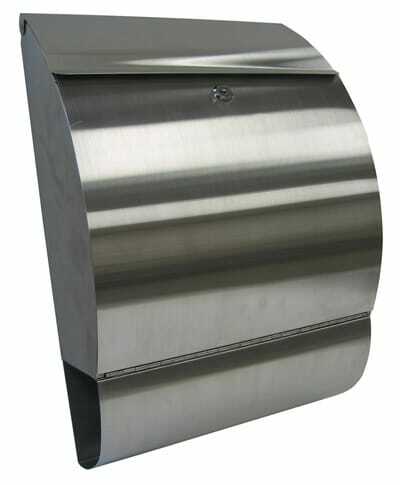 This Fuoriserie mailbox is available in 20 gauge #304 stainless steel, which is strong and rust resistant. It can also withstand all types of weather conditions. 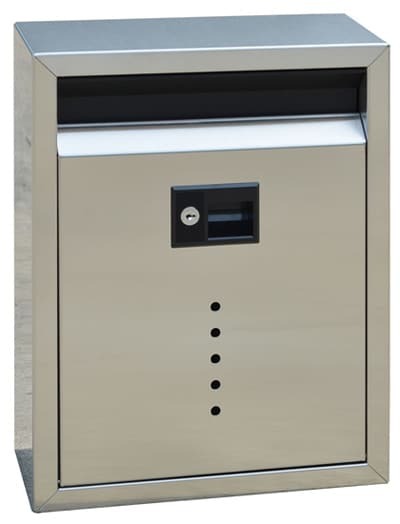 The black and bronze locking mailboxes are constructed of 20 gauge galvanized steel finished in polyester base powder coat paint. 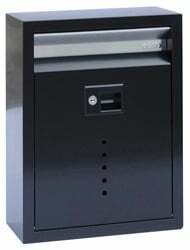 Combination spring loaded latch and locking device can be used as a locking mailbox or use without the key as a non-locking wall mount mailbox. 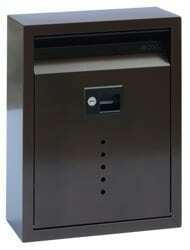 E10 Ecco mailboxes are delivered with 2 keys, mounting hardware and instructions for installation. 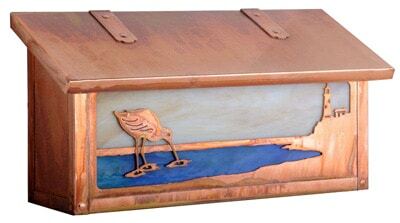 Official Ecco 10 mailbox dimensions are 11.5″W x 15″H x 5″D; slot size is 1.5″H x 10″W. 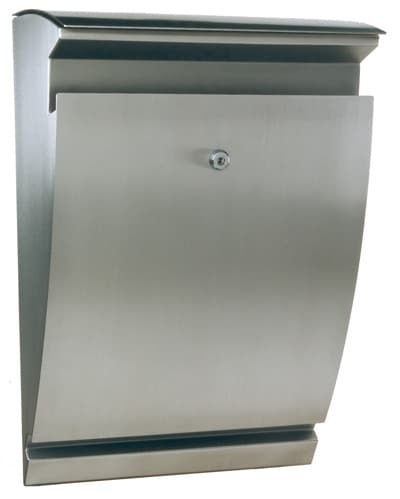 Compliment this Ecco Locking Mailbox with co-ordinating Ecco Address Numbers. 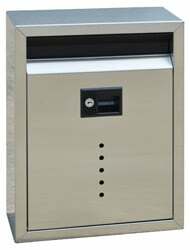 Continue shopping for more Wall Mount Mailboxes.